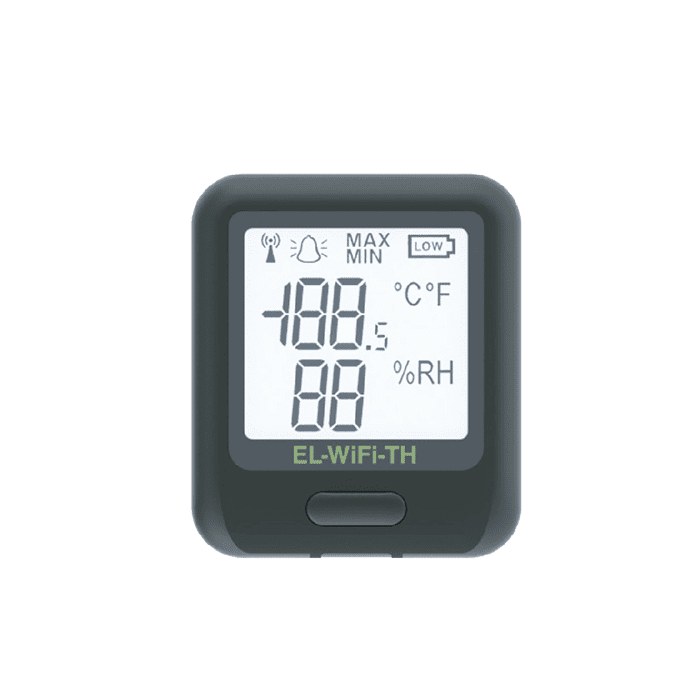 The Lascar EL-WiFi-TH WiFi Temperature Humidity Data Logger measures the temperature and humidity of the environment in which it is situated. This sensor is typically accurate to ±0.3˚C (+5 to +60°C) and ±2.5%RH (20 to 80%RH @ +25°C). Data is transmitted wirelessly via a WiFi network to a PC and viewed using a free software package or on the EL-WiFi-Cloud. During configuration, the sensor will search for an existing wireless network while physically connected to the PC. It can then be placed anywhere within range of the network. If the sensor temporarily loses connectivity with the network, it will log readings until it is able to communicate again with the PC application or Cloud(max 30 days at 10-second sample interval). The range of the sensor can be increased by using WiFi extenders. This EL-WiFi-TH WiFi temperature humidity data logger is a low powered battery device. When configured using typical sampling periods (e.g. once every 60 seconds) the sensor will operate for over one year. The battery can then be recharged via a PC or USB +5V wall adapter using the USB lead provided. The software installed on the PC will allow set-up, data logging, and data review. Set-up features will include sensor name, °C/°F, sample rate, and high/low alarms. Once configured, historic data can be viewed via the graphing tool or exported into Excel. This software is available for free from www.lascarelectronics.com. The EL-WiFI loggers are not supplied with software, however the control software is downloadable, free-of-charge from the Lascar website. The software is compatible with Windows XP, Vista and 7 (including 64-bit operating systems). Note, the software is not compatible with Mac or Linux.The EL-WiFI loggers are not supplied with software, however the control software is downloadable, free-of-charge from the Lascar website. The software is compatible with Windows XP, Vista and 7 (including 64-bit operating systems). Note, the software is not compatible with Mac or Linux.